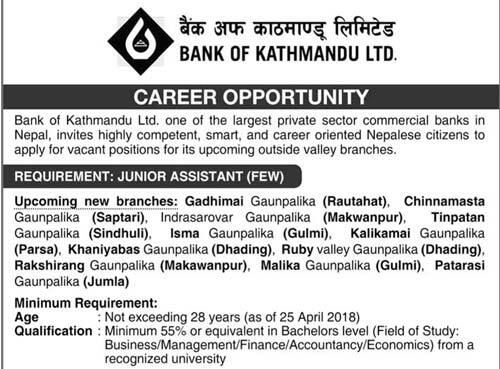 Bank of Kathmandu Ltd. one of the largest private sector commercial banks in Nepal, invites highly competent, smart, and career oriented Nepalese citizens to apply for vacant positions for its upcoming outside valley branches. Applications without including necessary documents or without disclosure of age/ marks / percentage/at each level of education shall be automatically disqualified. Only short listed candidates will be called for further selection process. The bank reserves the right to reject any/all applications without assigning any reasons whatsoever. Telephone enquiries will not be entertained.